July is a favorite month of mine to surface fish with dry sedge, particularly the big travelling Sedges of Western Canadian lakes. However, there are times of the day even in the prime sedge hatching season when a sedge pupa fished under the surface is the best way to catch those large rainbow trout. I recall an occasion when my friend, Tony Lillington, won the High Lakes BC Tel fishing derby using a large green sedge pupa on a sink tip fly line. Only an occasional sedge was actually hatching so Tony patiently worked the shoals at Doreen Lake with the big sedge pupa and was rewarded with the largest fish of the derby! Every fisherman's fly box should have some sedge pupa flies for these periods during the sedge season when there is very little evidence of surface activity. Body : Dark green dubbed seal hair. Ribbing : Optional gold mylar. Thorax : 4 strands of peacock herl. Hackle : Thin brown pheasant. The Doreen Lake sedge pupa is tied with a fairly thick dark green seal hair body. 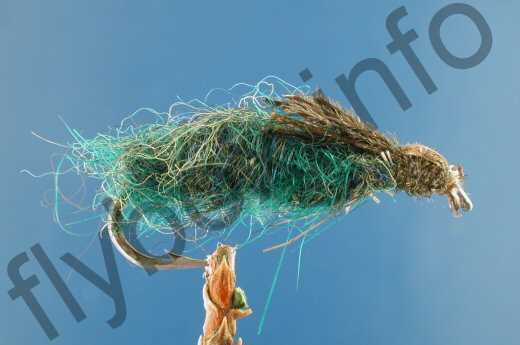 Start by fixing your tying thread to the hook shank and form a dubbing loop for an ample amount of seal hair. Twist the loop to get that frizzled perpendicular look of the hair and wind the loop from the hook bend to hook eye in a fairly large cigar shape, that is slightly thinner at the tail and head. An option is to add a gold mylar rib and also sometimes quite effective is a blue or light green wool rib to segment the body. Next, wind in one turn of brown pheasant feather to form a hackle at the hook eye so that it angles back when tied down. Clip the top fibres of pheasant feather off and then wind in a head using 4 strands of peacock herl. As you finish the head tie the herl down on the body side, that is away from the eye and allow the 4 strands to project back over the body to form the thorax or wing case. Clip the strands off at 1/4 inch, add some head cement and you have finished the Doreen Lake sedge pupa. Mustad 9671. Currently there are no comments about the Doreen Sedge Pupa fly pattern from other fly fishermen yet.